On our family camping vacation 2010, I took some time to visit the ONLY fabric store in the vicinity, Country Cloth. Although it's a small store, it's packed with inventory .. not only quilting (LOTS of quilting!) but general sewing supplies and machine embroidery too. A true general purpose store, staffed by very helpful ladies. They recently acquired the store space next door and use that as their classroom. One of the class samples hanging on the wall was "Take 5" and featured a fussy-cut focus fabric in the largest square. I *really* liked their focus fabric example and the staff showed me where the pattern was. I was completely astonished. Small wonder I passed up the pattern when I first saw it hanging on their pegboard. The cover quilt is quite underwhelming. You know, you only get one chance to make a first impression ... and this cover photo sure didn't impress me. BUT, the class sample SOLD me on it. The pattern requires 5 different fabrics (hence the name, Take 5). I found some teacup fabric that was fussy cut for one of the focus fabric. The other focus fabric was of fancy desserts. The other 3 fabrics are coordinating "solids". The pattern calls for a narrow inner border from one of the 5 fabrics and a wider outer border from another of the 5 ... 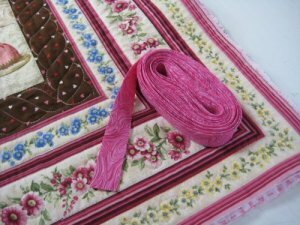 BUT ... during my online fabric searching, I happened to come across (what I hoped was) a FANTASTIC lengthwise border stripe in the pinks and ecrus of the teacups & dessert fabrics. I'm an absolute sucker for border stripes, so I bought a whole bunch of it. (I must admit to a love affair with border stripes. I LOVE using them, especially when I can do mitered corners. I LOVE mitered corners! I feel so smug when they come out exactly perfectly matched and flat at the corner.) The narrow inner border will be from a darker pink and I'll use the lengthwise border stripe for a mitered border. When I saw the fabulous border stripe online, it looked to be a great match. I really should have known better. Colors on a computer screen are NEVER true to life. ::sigh:: When the border stripe arrived, I saw that the pink was actually more peach in tone and it unfavorably contrasted with the bubble gum pink of the quilt. I was disappointed because this border stripe looked SO wonderful online ... but that's the problem with buying online .. you don't get the true colors. Fortunately, I had another floral border stripe in my stash, one that DD #3 liked much better. How fortunate, as this quilt is going to her. :-) The reason WHY this quilt is for her is ... DD#3 is enamored of all things English. 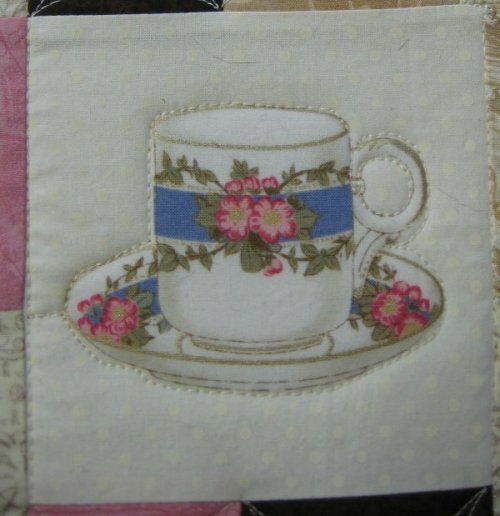 "Taking tea" is about as English as you can get and the teacup fabric is just so pretty. She also is an *excellent* cook, baker and candy maker .. so the fancy dessert fabric fits her to a "T". Truth be told, I actually did prefer the other border stripe fabric ... it was a simpler design. I think I suited the busy piecework better. This floral border stripe is a tad too busy for my taste, but since DD#3 likes it better, that's all that matters. 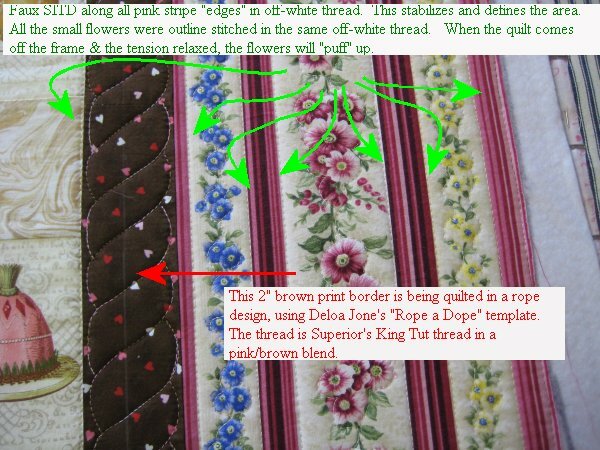 Since the border stripe that was being used had dark pink in it, an inner border of more dark pink would not have set the interior properly. Instead, I used a dark brown fabric that has teeny-tiny pink hearts sprinkled all over. Flash forward to December 2011. Yes! This top has now beenloaded onto Lizzie and the quilting commences! Remembering that the border is really a printed border stripe, there were two ways to approach this. One: treat all the stripes as *one* large area to be quilted ... say, with feathers or other large scale design. Spanning obviously separate areas with quilting continues to be a concept that I don't think of first. Two: treat each stripe as a separate entity for quilting. This is what occurs to me first. It seems obvious .. and therefore, expected. Is that to be avoided? I'm not sure; coming up with quilting designs is a different skill than quilt construction. For me, it requires more art ability than technician .. and I'm dismal at art. Soooo ... I tend to keep with the obvious, the expected and "safe". I decided to go with option Two. :-) I did a faux stitch in the ditch to define and separate all the border stripe elements. Then, all the flower bunches were closely outline stitched. Not every single flower, but just the overall perimeter. When the quilt is washed, these outlined areas will puff up slightly, giving it a lovely 3D look. Because the quilting in the border areas for this quilt is done as a continuous design, it is much easier for me to defer quilting the side borders. I quilt the top border, the interior and then the bottom border. Then I remove the quilt, turn it, re-pin it and quilt the former side border, which are now in the top & bottom position. In the course of quilting the interior, I *do* edge-stitch the raw edges of the sides in order to stabilize them. 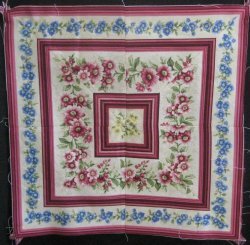 The interior of the quilt has solid squares sprinkled around the novelty fabrics. 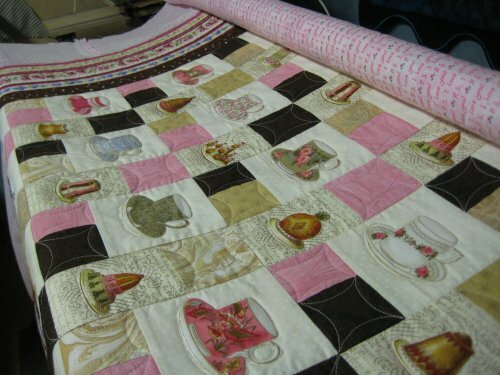 I like doing continuous curves in patchwork like this. There was a drawback to continuous curve quilting that didn't occur to me until I was well into the qulting. The patchwork squares are not the same size ... they aren't all *squares* ... some are more rectangular. 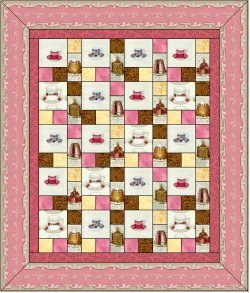 This makes the layout design more interesting to look at but this design choice became a quilting problem. Because they are not the same size, the continuous curve quilting is not the same for each. The continous curve quilting meets at the corners; the curve between those two points will vary if the distance is different. This became readily apparent with side-by-side units ... while the vertical curves were similar, the horizontal curves were visibly different. BUT ... I knew that if I stitched a denser background filler around the teacups and desserts, the background filler would flatten it, making the teacups and desserts more prominent. I really liked that idea. But DD#3 had a different vision. 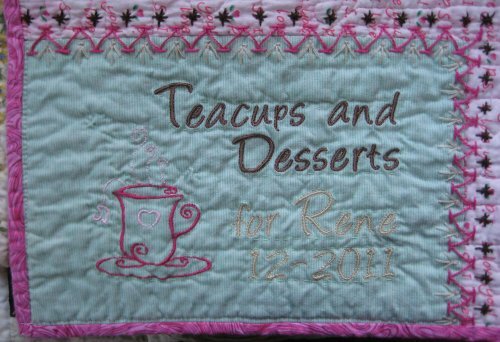 She really liked the background print around the desserts and felt that stitching over it would obscure it. Since the customer is always right, outline stitching sufficed; no background filling stitches were done. 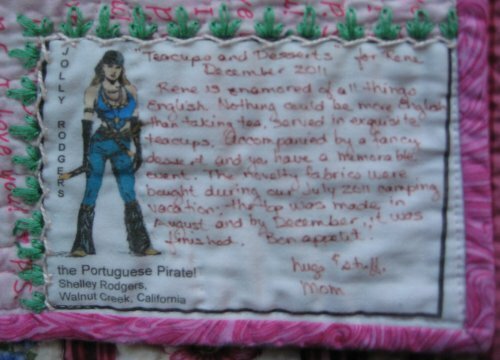 On my pirate label, I hand write (with Pigma Micron pens, size 05) the name of the quilt, when it was made and for whom. But, more importantly, I write as much journaling about the quilt as I can fit in. This is the abbreviated backstory of the quilt, which to me, is just as important as who made the quilt. Because I found myself with time on my hands, I also put some *very basic* hand embroidery stitches around the non-bound edges, ala crazy quilt embroidery. I then attach the label when the binding is sewn on. This makes the label a little bit more permanent; a little bit more difficult for nepharious ne'er-do-wells to remove it (should, Heaven forbid, the quilt be stolen). 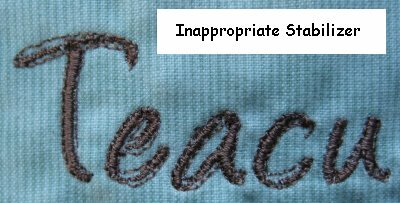 In recent times, I have tried to remember to use my embroidery machine more to make labels. It's an expensive piece of equipment and I should be using it! I chose a teacup design for this label from Hatched In Africa. It's part of their 10 free teacup and teapot designs. The alphabet is Angelina Handwriting, which I got through Sew Forum. I also put some *very basic* hand embroidery stitches around the non-bound edges of this label. 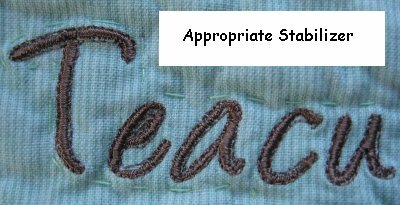 In stitching out this embroidered label, it was painfully brought to my attention that the proper stabilizer is Very Important, especially when there are outline stitches. For the first stitch-out, I used a perforated tear-away. Unfortunately, this stabilizer wasn't sufficient for the outline stitching to track properly. You can see how badly it turned out. Unacceptable. But, with a stiffer stabilizer ("Tear Away Plus" by HTCW), the stitching came out perfectly. Recently, I have read of QR codes being printed onto quilt labels. [12/19/11 Addendum: oops. It appears that "Seams To Be" inadvertently crashed their blog. They are in the process of re-building it. Until they do, the linked blog entry won't be available.] These QR codes then refer the person to a webpage (or something else). 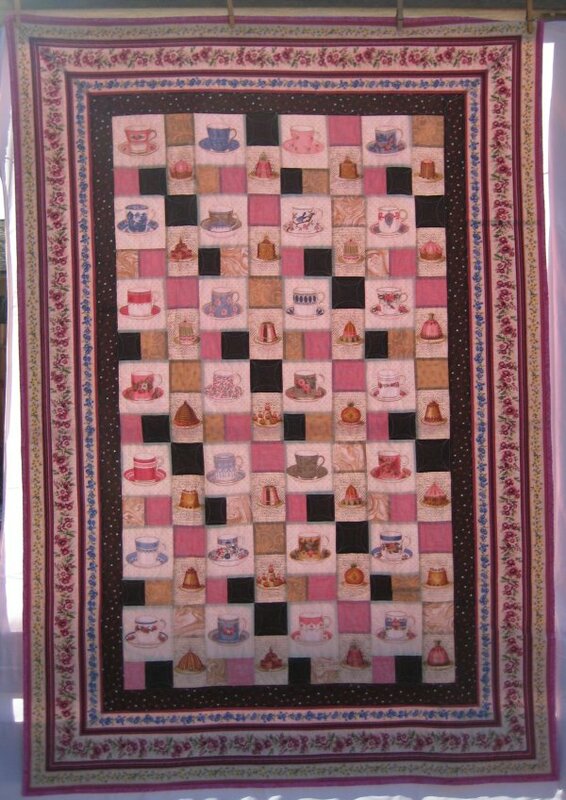 One quilter thought that this would be another way to "prove" that a specific quilt had been made by her, in the situation where the quilt was stolen. There are many websites that will generate a QR code for free. 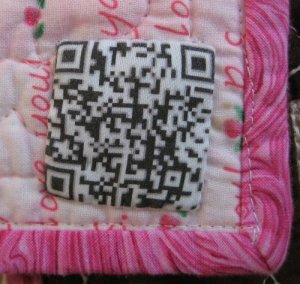 I decided that I would put a QR code that pointed to *this* web page on this quilt. This is the actual QR code printed onto fabric. I don't have a smart phone that can read QR codes but DD#3 does .. and, in fact, this QR *was* able to be read and this page DID come up on her phone! Technology can be simply amazing! Finally ... it was time to do the binding! I had a marvelous, printed fabric that looked like it had been marbled. Miles of bias binding was made, sewn to the back, flipped to the front and machine top-stitched own.